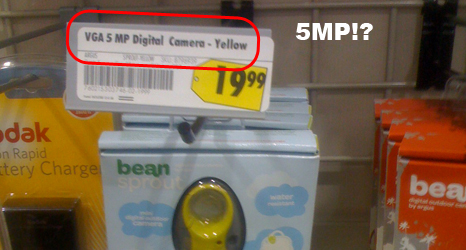 Best Buy’s 5mp Camera for $19?! Was in the local Best Buy with my girlfriend the other day and saw this “Bean Sprout“. I remark “Oh cute it’s a little camera with a carabiner and…oh my god 5 megapixels for $19! !” Of course before I yelled it out I quickly whip out the iPhone and after making sure the wi-fi is turned off (because BB is notorious for having a rigged version of websites override the real ones while using their wi-fi) I did a google search for this little bean camera and found that it was actually not 5mp but rather VGA (640×480). Obviously the label says “VGA 5MP”. That’s like saying it’s a 4-cylinder V8 car. I was pretty disappointed because I was going to buy every single one of them and give them away as gifts. What’s the problem here and how did this happen? Well pretty simple – the red box in the corner of the picture above really is 5 megapixels and is the Bean Sprout’s older sibling – the Bean. More than likely the idiot typing up their stickers/labels just got confused. I told the nearest Best Buy employee about the mistake and I’m sure it went no further than the toilet after lunch. I would’ve bought the camera any way had it been 1.3mp-2mp for $19… It’s ultra small, portable, rugged, and has a built on clip so you can attach it to anything you want. But I’ve got a cell phone that takes better pictures than VGA so I’m not really in the market for it. Sorry just ranting about advertising ignorance. Best Buy is the kind of bad labeling. When Rainbow Six Las Vegas 2 came out, they had a tag on the shelf for the special edition for $59.99. Of course it rang up 10 bucks more at the register. So they sent back one of their goons to check and despite what the shelf said, they still insisted on charging the extra ten bucks. I said screw it and didn’t buy anything.